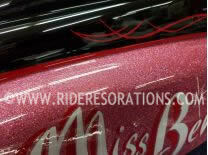 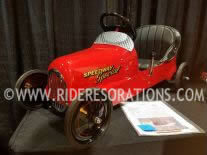 'Ride Restorations' is your source for restored pedal cars. 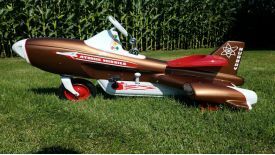 Specializing in the restoration of steel pedal cars produced by Murray, Garton, American National, Steelcraft, Toledo, and many more. 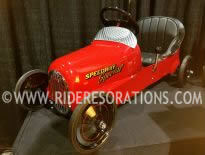 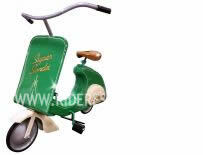 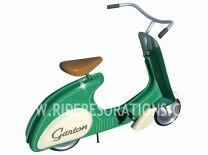 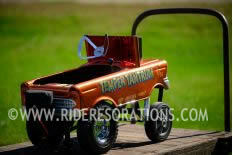 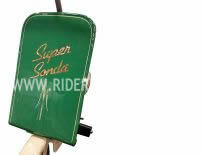 'Ride Restorations' also offers service on pedal planes, pedal trains, tricycles, wagons, and more. 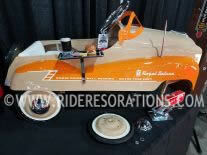 In addition to restoration we offer restoration parts/supplies for your project, a locating service to find exactly what you're looking for, an on hand inventory for sale, pedal car accessories, and much more. 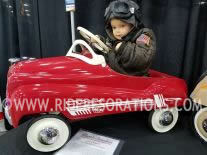 You'll even see some new, reproduction pedal cars that we've customized to create a vintage look on a budget. 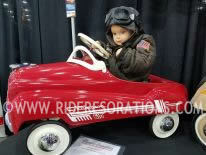 Contact us for all your antique pedal car needs; Buy, Sell, Restore, and parts. 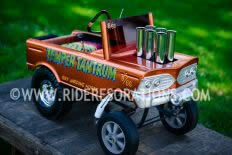 Temper Tantrum Gasser Pedal Car. 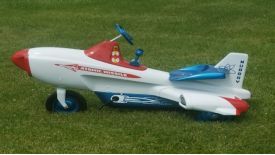 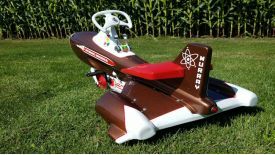 Built from an original 'Murray Tee Bird'. 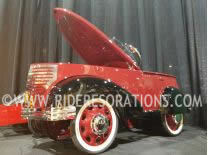 Full Custom includes; gasser chassis, velocity stacks, chrome rear wheels, butterfly steering wheel, and so much more! 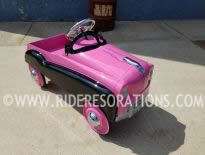 Description: Mild custom pedal car restoration. 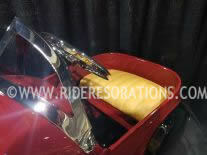 Modifications include; LED lighting (front and rear), Continental spare tire, Custom upholstery, Original pedal adjustment tag, 'White Wall' tires, and more. 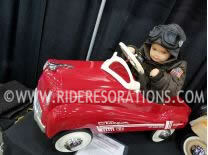 '37 Ford' garton pedal car restoration. 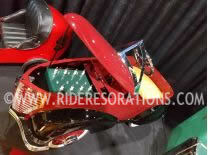 Modified opening hood, faux engine, and leather seat upholstery. 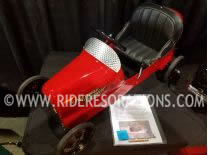 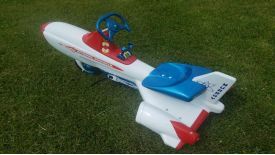 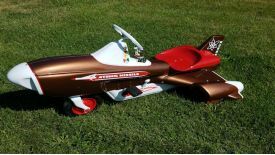 Restored Murray Champion pedal car with custom paint layout. 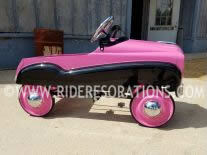 Murray 'dip side' pedal car restored by Ride Restorations with a later 'flat side' FBI paint scheme. 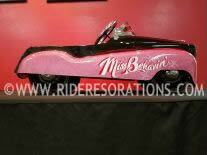 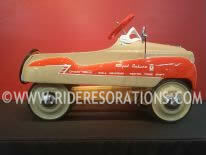 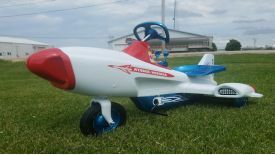 Elaborate Peirce Arrow pedal car restored by Ride Restorations. 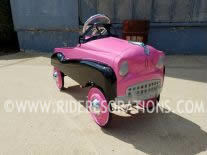 The car offered working lights, two speed transmission, 4 wheel suspension, working doors, folding top, leather upholstery, and much more! 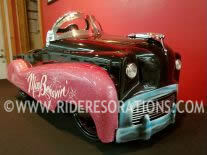 Customized Murray Dip Side Pedal Car Lowrider. 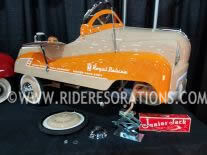 Custom built chassis and accessories.